In my studio you will not find shelves with neatly stacked boxes, all labeled and organized. 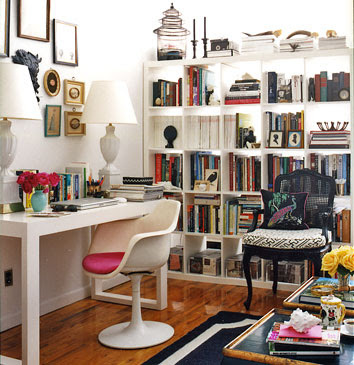 You will not find vast shelving units, and large clear workspaces. You will be sure to find something so cluttered and horrific that I am not willing to share any photos or go into any further details. 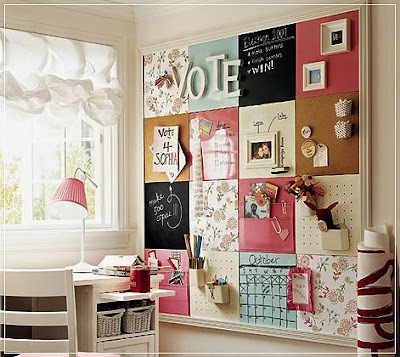 :) I will, however, share these inspiring images of what I dream of my craft room/art studio becoming someday! Ah the vast shelving unit. It makes me so happy to see everything put away, when it actually has its own place. In my studio there is no such unit. But there are plans and dreams of making one. 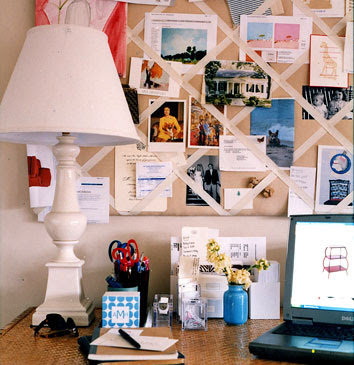 All art studios need an inspiration board. This is something I do have but it lacks beauty and charm. I dream of something that is beautiful even when nothing is tacked on it. love the Quaint Handmade stuff. Makes me think of you. Drooling now. Love organized people. Covet their powers. True to my nature, the first pic is making me want to head to Ebay to pick up a blue typewriter! hi lorajean! i just discovered your blog and was so thrilled to see our studio included (quaint handmade). thank you so much for the nice comments everyone.